It’s been more than a month since InterExchange Work & Travel arrival orientations took place in four major cities across the U.S.: New York City, San Francisco, Denver, CO, and Reno, NV. 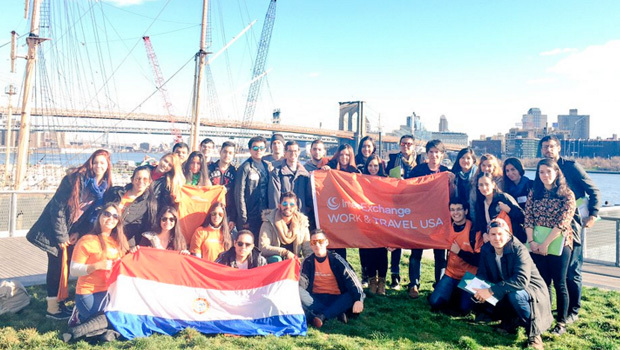 Over the course of three weeks, we met 300 Work & Travel USA Program participants from Argentina, Brazil, Nicaragua, Costa Rica, Paraguay, and Peru. One of the most enjoyable parts of the arrival orientations is meeting our participants in the very beginning of their American adventure. This gives us the opportunity to discuss their program goals and travel plans, as well as give them advice regarding places of interest in NYC and other cities. The InterExchange office is located in New York City's Financial District, or as New Yorkers call it, FiDi. We gave all of the participants who attended an orientation in NYC a specially designed cultural map of the city and a walking map of Wall Street. Download the map to take the tour yourself! Thank you everyone who attended InterExchange arrival orientations. We look forward to welcoming you at our office next time you visit NYC! An international exchange alumna originally from Ukraine, Tanya started her career at InterExchange in 2011. Tanya is passionate about travel and cultural exchange and enjoys meeting J-1 exchange participants at InterExchange events. Work and Travel in the U.S.
InterExchange will be your sponsor for an unforgettable cultural experience as you work, earn money and boost your resume with our unparalleled support and experience!